Some unscrupulous chimney companies are selling ceramic / refractory hybrid coatings (such as Heat Shield, FireGuard, Thermocrete or Smoktite) in un-lined solid fuel chimneys (such as for fireplace and wood stoves). Please keep in mind, that when used properly some of these are good products but using any of these products in an unlined solid fuel chimney does not meet building code requirements and no building department is supposed to accept this as a chimney lining system for this application! Sprayed on coatings such as Thermo-crete or slip coatings such as HeatShield are listed to only be used in code compliant solid fuel chimneys, that means they must already be lined! Sorry to say that all to often we have had to fail chimneys on inspections where people have spent thousands of dollars on spraying with a flue coating or doing a slip coating only to find out that their chimney is still not lined (and doesn’t meet the safety standards of a lined solid fuel chimney) and they could have had the chimney fixed with a properly listed and approved lining system. Please don’t get confused, when the situation is appropriate, Chimney Savers does in fact use recommend some of these types of flue coatings, but only as they are supposed to be used, such as repairing joints to an an existing clay liner or in a smoke chamber as an approved parging material or for oil or gas appliance flues when the situation allows for it (no structural defects). 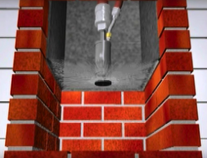 It is also important to mention that sprayed on and slip coated flue coatings do not provide any significant lasting structural support to the masonry inside the chimney that may be in poor condition, such as large sections of missing masonry and bricks or even loose and falling bricks from the flue divider walls. Installers of these ceramic / refractory hybrid formulas have been quoted as saying that “this product withstands high temperatures and dissipates heat throughout its length”. Which is in fact completely true, but by saying only that, it is misleading to consumers because although the product itself can withstand high temperatures and it does in fact dissipate heat throughout its entire length, flue coatings are too thin to be considered a stand alone liner for solid fuels and they do not provide the required insulating R-factor or thermal transfer K-factor that a solid fuel chimney lining is required to have in order to pass testing from an independent testing laboratory such as UL (Underwriter’s Laboratory) and that is why it is not considered to be a lining for this application and is designated to only be used over a existing liner in these circumstances. 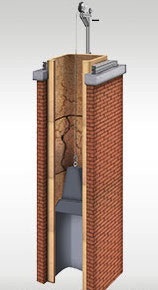 During testing these flue coatings withstand high temperatures themselves but without being applied over an existing liner, they fail to prevent unacceptable levels of thermal transfer out of the chimney which is the number one cause of structural fires due to a chimney and one of the most important reasons why solid fuel chimneys are required by the building code to be lined in the first place. Installers for these types of products often show the consumer a (independent testing laboratory such as UL or Warnock Hersey) listing. Be careful, even though a product has a listing it must be used in accordance with that listing and for the purpose of which it was tested, in other words if the product is approved to be used as a chimney liner it will clearly say that the product is a “chimney liner” and which applications it can be used as such, for solid fuels sprayed on and slip coated flue coatings and sealants are not, they are only listed for that application to be used for liner repairs such as flaking clay flue tiles, or refractory joint repair of clay tiles, and they do a good job for that purpose. But they should never be used when a structural issue is present or if a flue tile has cracks over 1/8th inch thick or when the flue tiles are loose or broken and definitely never when a solid fuel chimney lacks a liner. The manufacturers of these flue coatings acknowledge all of these limitations, and reflect that in their warranties and product information, unfortunately some installers refuse to acknowledge this because spraying on a flue coating is incredibly quick, easy and inexpensive compared to the building code approved method of restoring those types of chimneys which usually involves complete removal of damaged, deteriorated or loose clay tiles and / or brick divider walls and replacing them with a fully listed and approved solid fuel liner system. We have seen proposals from other companies to spray an unlined fireplace chimney and when pushed for an answer some installers say other systems typically used such as cast in place lining won’t work in certain situations that only a spray on coating would. I have yet to see that in my many years as a chimney professional. Usually they talk about sizing issues, but these issues are addressed when brick divider walls are removed from flues (a service most companies won’t even offer because of its difficulty, but we do regularly). The real issue is that these companies simply don’t offer what the customer really needs which in these cases is usually a cast in place lining. They can’t offer it to their customers because of the high start up costs and the extensive training and experience needed before someone would even attempt such a job, an inexperienced cast liner installer could destroy a chimney with hydraulic pressure and even cover the floor of a home with cement, so for these reasons few companies even offer cast in place lining. Simply put, for solid fuels if a sprayed on or slip coated flue coating (or sealant) is used for the type of repair that it was designed for such as sealing or coating an existing liner that has damage yet is structurally sound, it usually does a good job, anything other than that…your using it wrong and you need a different product. Chimney Savers will be happy to guide you in the right direction, even if something you need is not something we offer, we have the integrity to tell you and not try to sell you the wrong thing. Please be aware there are several contractors who don’t seem to care if they do their job right, we see that type of work constantly. Take a look at our pages on either cast in place lining (typical for fireplace relining or chimneys with good masonry but in in need of some structural help) or our stainless steel (see insulated heavy duty) liner pages (typically for wood stove and insert relinings) for more information on the proper way to line unlined solid fuel chimneys.